Family-friendly places like Sea World Theme Park and Dreamworld will thrill your kids. Change things up with these side-trips from Gold Coast: Brisbane (Lone Pine Koala Sanctuary, South Bank Parklands, & more) and Moffat Beach (in Caloundra). There's much more to do: get in on the family fun at Warner Bros. Movie World, learn about wildlife with up-close encounters at Currumbin Wildlife Sanctuary, don't miss a visit to Rotary Carousel Broadbeach, and tour the pleasant surroundings at Surfers Paradise Beach. To find ratings, where to stay, and other tourist information, you can read our Gold Coast trip maker . If you are flying in from Singapore, the closest major airports are Brisbane International Airport and Gold Coast Airport. 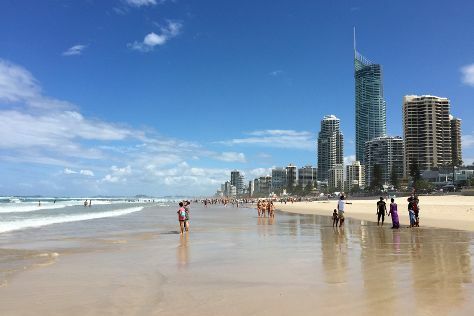 June in Gold Coast sees daily highs of 24°C and lows of 13°C at night. Finish your sightseeing early on the 8th (Sat) so you can travel back home.